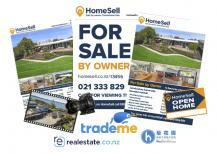 HomeSell - Marketing packages for Taranaki, Wanganui, Manawatu, Horowhenua & Central N.I. Taranaki, Wanganui, Manawatu, Horowhenua & Central N.I. The information on this page is for the 'Taranaki, Wanganui, Manawatu, Horowhenua & Central N.I.' region. If you're selling somewhere else, click to change region. Click for Taupo or Dannevirke.